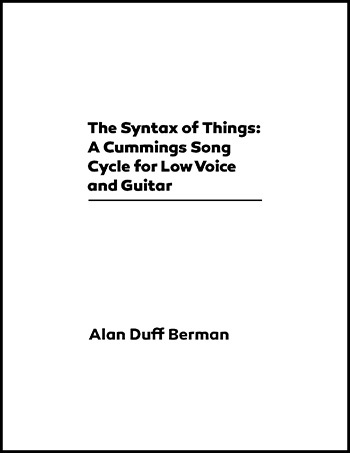 A sensuous, contemplative cycle of four E. E. Cummings settings for alto voice and guitar. The guitar and voice parts are richly resonant; the harmonic language ranges from impressionistic, minimalist fabrics to power chords. One song features a glass slide. The cycle is dedicated to alto vocalist Alexandra Grabarchuk, who premiered the cycle with the composer on guitar in 2014. "since feeling is first", "i like my body when it is with your", "i carry your heart with me(i carry it in", "somewhere i have never travelled,gladly beyond". Copyright (c) 1923, 1925, 1926, 1931, 1951, 1952, 1953, 1954, 1959, 1980, (c) 1991 by the Trustees for the E. E. Cummings Trust. Copyright (c) 1976, 1979, 1985 by George James Firmage.